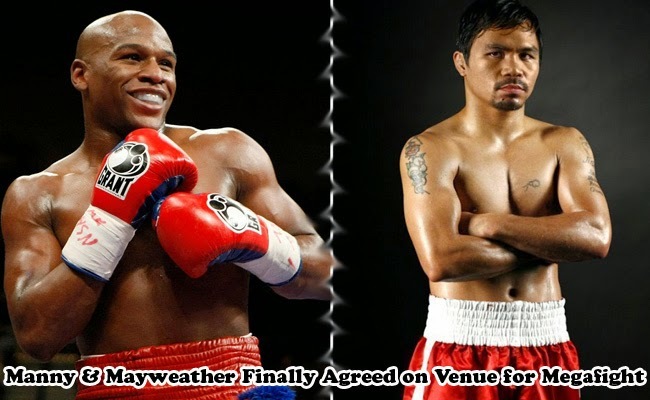 The megafight between Manny Pacquiao and Floyd Mayweather Jr is nearing its reality as it had been reported that both camps had finally agreed that the bout will take place on Las Vegas’ MGM Grand Garden Arena. The fight was also predicted to yield around $250 million, breaking the history of boxing’ box office record. The two had been nearing their retirement, making boxing fans give more pressure on both side to yield and make the fight happen. On December, Mayweather announced that he was willing to fight Pacman on May 2. Many had their hopes high until January when the camps accused each other of stalling the agreement. Boxing fans’ hope once again picked up as the two boxing icons were seen talking to each other during the half time break of an NBA game. As reported by The Telegraph, Pacquiao had already finished singing his end of the contract and only awaits for Mayweather to affix his signature. Pacquiao also shared that he had already started his training in General Santos, Philippines for his next fight. One of Mayweather’s conditions that he discussed last December is that his network company, Showtime must be the one to cover the fight. Pacquiao’s network on the other hand is HBO. The two broadcasting companies had reached an agreement to air a joint pay-per-view event which had already been done in 2002 for Lennox Lewis- Mike Tyson bout. Furthermore, it had been reported that both camps of the iconic boxers had agreed to take up random drug testing which had been one of the main issue why the agreement for the megafight had been dragged for years. Manny Pacquiao was also reported to have agreed to have a smaller share in the earnings. He had earlier shared that he wanted the fight to be a gift to the boxing fans more than for monetary reasons.